How did Corazón de Volcán begin? Corazón de Volcán started from a ritual. 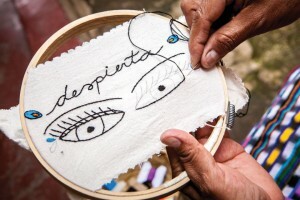 Lucia’s early passion for embroidery; the ritual inherited in the hands of Guatemalan women, who, stitch by stitch, embroider their shared memories; has always been the impulse of Corazón de Volcán. This tradition, which gradually changes over the years, bears a mystical symbolism in each figure, design and color. 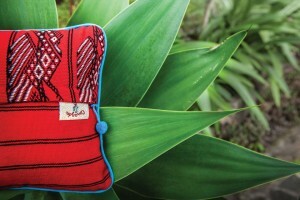 The perfect match is given by combining the expertise of Guatemalan women embroiderers and their ancestral knowledge with Lucia’s artwork. The designs that emerge from this alchemy are unique and fresh, filled with innovation. In Corazón de Volcán we admire tradition, respect cultural heritage and guard ancestral knowledge. We are also firm believers in innovation, in combining materials and in the value that comes from including new elements while respecting the traditional ones. In Corazón de Volcán we recycle traditional fabrics and use them to make our pieces putting them together with the embroidery and designs made specifically for each piece. In this way, we are bringing back to life those used objects and changing their destiny. We carefully choose each piece of fabric so that it may retain its meaning and become part of a new piece. This makes each product one of a kind.